The first thing I noticed, after the scale of the place, was how dark it was. One can see the few skylights here and there, and also the horrible fluorescents, everyone of which was a different color temperature. One can see the terrible green of the fluorescents fighting with the blue color that sunlight appears here when I attempted to choose a color temperature in my camera between the two. 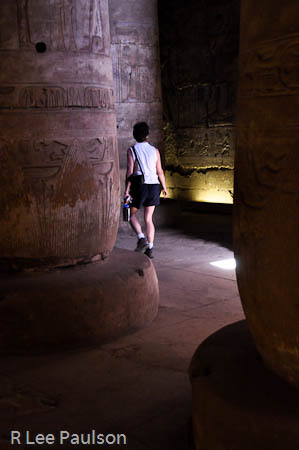 When one first enters the temple the first two chambers are filled with columns. There are 24 columns in the first chamber and 36 in the second. 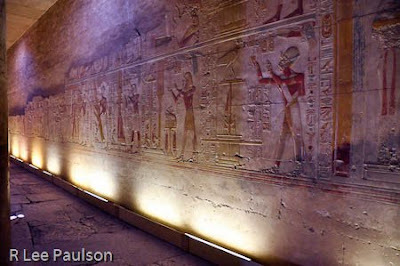 As you can see, the walls of the place and every square inch of the columns was inscribed with images and hieroglyphs. The next post will be devoted entirely to some of the images and I'll try to explain what some of them mean. In order to do that, it will be necessary to offer a little bit of background into ancient Egyptian thinking. As West said, "the whole thing works together in its entirety. However, the only way one can learn it is piecemeal, all I can say is by the time the trip is over you will have a better idea of how the pieces fit together than you do now." Any insight that I am able to offer here will be even more abbreviated, but I'll do what I can. (You really do need to go and experience it first hand yourself.) The short version of the long explanation is that for the ancients, their religion pervaded a much wider portion of their lives than ours typically does today. For the ancient Egyptians, their science, their mathematics, indeed everything about their way of life was intertwined with religious meaning. The wall in front of which Sheahan was standing in the previous image. Notice the concrete ceiling, which replaces the missing limestone blocks in the upper left. With all of our cultural baggage, with the ongoing tensions between our scientific and religious communities, as well as our memories of the religious suppression of scientific progress during the dark ages, it's easy for many of us to blanch at the thought of having both science and religion under one roof, as it were. However, as one digs deeply into the ancient Egyptian culture, one finds a congruence between hard science and religion back then. In the beginning was the word. And the word was God. We have that in our bible. In their tradition, in the beginning the Universal One, the All, the Infinite, moved from its state of rest and began vibrating (vibrating equals sound which was the word). The one did not become two in their view, because there is only the one. However it did schism into two different aspects. The one became two, and immediately then three, the reconciling principle came into being. 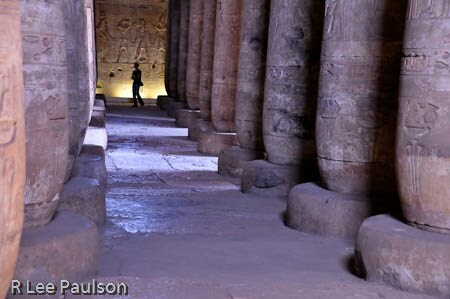 This is the back of the two hypostyle chambers. Along this back wall, are 7 small chapels, if you will. One can see two of the chapel doorways here. 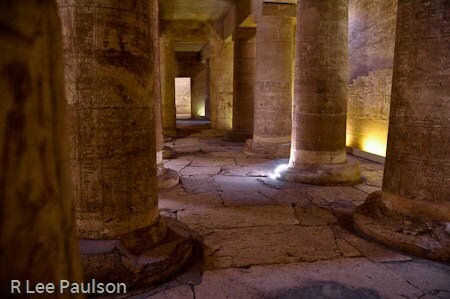 The blue at the tops of the columns and on the floor is from sunlight coming in through the small holes in the roof. Notice the niche on the right, after the first opening. There was one niche for each of the seven sanctuaries. Each sanctuary represented a different 'god'. Now we see the importance to the ancient Egyptians of the number three, as in the three small sanctuaries back in the Luxor Temple, of which I said I would explain the significance later. 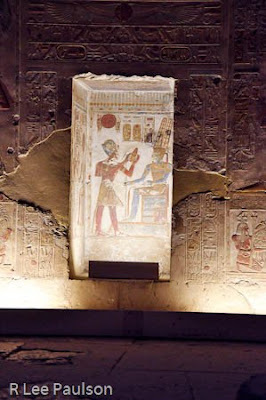 A closer view of one of the niches in the wall, complete with garish lighting. All of Egyptian math had a similar symbolic meaning. All of the gods were anthropomorphisms of scientific and cosmological principles. Indeed, Laird Scranton, an independent researcher, has found a direct, perfect, correlation between the major Egyptian 'gods' and the principles of particle and string physics which bring matter into being. It appears that instead of teaching these principles in a left brain setting as we do, the principles were taught also in myth. Especially to the masses. our scientific principles and they did. The ancients struggled with the same issues as we do. That is, just as I want to know who lit the fuse and set the big bang off, they did not know what made The One begin to vibrate and become 'the word', and thereby create the universe as we know it. 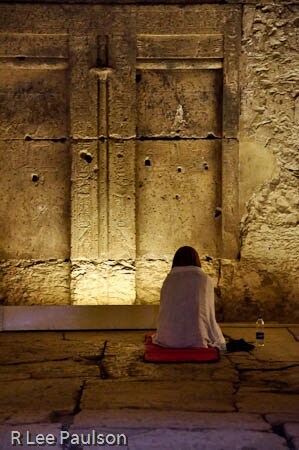 This lady is meditating in one of the small sanctuaries. Presumably, the blank spots in the walls held statues of the 'gods' honored by this sanctuary. Six of the seven sanctuaries weren't very big, maybe 25 feet wide by 40 feet deep. If we are able to let go of our arrogance and our belief that no one before us had any conception about the scientific details of particle theory, we find out that the ancient Egyptians, at least, had a very coherent understanding of the universe--in some ways, better than ours. Indeed, modern physics is coming to see our universe in very interesting mystical ways. (Possibly catching up, as it were?) That, however, is a discussion for another time. Here's the diagram again of the three sanctuaries from Luxor Temple. 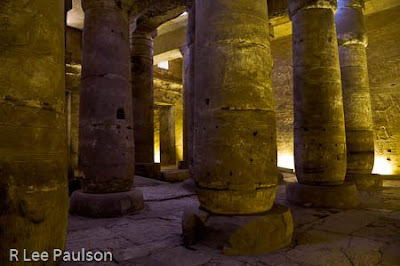 This is the best shot I have of the room with the 10 columns, honoring Osiris. The columns were spaced too closely together for me to get a shot of the three sanctuaries behind me. The second doorway above, however, enters the middle sanctuary in the smaller room with only 4 columns. The reconciling principle recognizes the principle of duality inherent in the universe. In the Luxor Temple we have the night verses the day, the cycles of the year with its cycles of birth, growth, death, regeneration, along with the cycles of life and the need for all life needing a polar charge, an opposing force if you will, in order to exist. Here in this temple we have the cycle of life and death and the spirit of the deceased finding its way back and reconciling with The One. The principle of three seems to be a universal concept among many religions. It has come down to us in the form of the Christian Trinity. 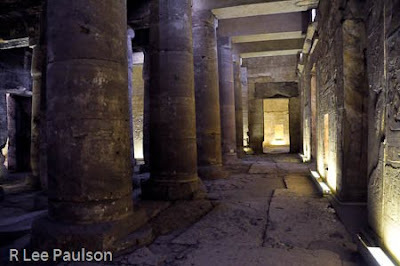 We know that in ancient times only initiated priests were allowed inside places like this. Bottom line here is that, just as in every other aspect of ancient Egyptian culture that we have seen, the ancients have chosen their symbols very carefully, imbued each with multiple layers of meaning, and all of it made perfect sense both from a religious as well as a scientific perspective. Symbolists, like West, believe that is true, even if we still do not currently understand much of the symbols of the ancients that we see. We know also from the hieroglyphs we have decoded that the ancients spoke of a mysterious body of knowledge they alone understood, a body of knowledge intended to remain hidden from all but those who were deemed worthy to learn. We can study all of the images, study all of the hieroglyphs, and surviving documents, and we will probably still never fully understand the full meaning of what we see in places like this. Like Melony above, we can only walk, watch and wonder. Continue on to Post 19: Abydos II by clicking here.